The English translation of Itadaki’s Famitsu interview back in July 16 with Devil’s Third on topic has been publish in the his own Facebook page, bringing it’s insightful replies to the Western speaking world. Here it is in it’s full by using the power of copy+paste. Can you imagine living in a world without copy+paste? FAMITSU: Devil’s Third is finally complete! ITAGAKI: Thank you. There’s a lot I want to talk about today, but my policy for the last 25 years has been that games are meant to be played, so before we start this interview I’d like you to give the game a try. I know we’ve just started, but I’ve got a completed copy of Devil’s Third here set up for you—please give it a go. ITAGAKI, after watching me complete the stage: How did you like it? FAMITSU: It felt great! Being able to perform such exciting actions so easily makes me think it was one of your major focus points for your tuning. I played pretty slow [laughs], but I could feel it was really easy to play, and I really appreciated the thoughtfulness of the frequent auto-saves. I feel even players who have never played an action or a shooter could easily follow the game, while at the same time being a really enjoyable experience for seasoned players. I also felt a lot of thought went into all these areas. Being able to configure the controls was great and everything felt very natural. ITAGAKI: That’s right. You played through the introduction, one very small part of the overall game. I wanted you to try it out because even though you can explain something in 1,000 or 10,000 words, there’s no substitute for actually experiencing something yourself. One thing that I was careful about . . . I’ve made an A-class action game already with Ninja Gaiden, and DEAD OR ALIVE ranks up there with Tekken and Virtual Fighter; so when I became an independent developer, I started thinking about what kind of game I wanted to make. I thought it’d be pretty boring to make another fighting game or another hack-and-slash—life is short, you know? [laughs] I decided I wanted to challenge myself in another genre. I had a really strong desire to make a completely new type of game. Sort of . . . a culmination of all my games up until now. FAMITSU: A culmination of everything so far. ITAGAKI: That’s right. That’s the idea I had, that’s what I wanted to make. I wanted to take everything I had learned making action games, everything I had learned making fighting games, and merge them into a completely new type of shooter. Just tossing them in haphazardly is going to make a mess, when you gave it a try you didn’t feel anything strange did you? FAMITSU: No, everything felt fine. ITAGAKI: That’s because you can play it as either an action game, or as a shooter. In the end you’ll probably end up playing it as both. But for now, players can play it in whatever style they want. It’s wide open like that. I’d love for Ninja Gaiden and DEAD OR ALIVE fans to play it. I say action, but it’s actually a shooter with strong action elements. FAMITSU: That’s what it felt like when I tried it, yes. ITAGAKI: As far as shooters go, I’m still in elementary school, so I had to do a lot of research on shooters from other studios. We looked into them in really fine detail—what’s the cursor like, what’s the crosshair like, et cetera. We had to play around with a lot of really fine dials. But there are a lot of those details, and they quickly add up and build on each other. Just stuffing a ton of elements in doesn’t mean the player is going to have a good time though. That’s why controllability is important. It’s like Gekken—different from normal Kendo in that rather than aiming for the gloves, head or chest, Gekken is about using whatever techniques necessary to kill your opponent. Gekken and guns and martial arts . . . You can throw weapons [laughs], you can throw molotovs, you can guard, you can dodge, you can jump, you can slide . . .
FAMITSU: Yeah, all of that is in there. ITAGAKI: Normally, trying to put everything in just makes it all a mess, but we were able to fit it all in Itagaki-style. I asked you to give it a try because I was sure you’d be fine. ITAGAKI: You were really invested in those molotovs, weren’t you. [laughs] Don’t worry though, you’ll get used to it quick. [laughs] How long were you able to play? FAMITSU: Umm, about 20 or 30 minutes. ITAGAKI: It was actually about 30 or 40 minutes. I’d like to think time seemed to go by quickly since you were having fun. FAMITSU: Ah, if you include the demo then maybe it was about that long. FAMITSU: So, what I’ve come here to talk about this time—and some of these may be some hard topics, but it’s been a long time from the conception of the game until now, hasn’t it? And during that time, Valhalla hasn’t put out any other titles. Now Devil’s Third, the title you guys have been working on for so long, is finally going to see the light of day. A lot of users know the name Devil’s Third, waiting for it thinking, “Why isn’t it out yet?” or, “When will it be released?” And now it’s finally coming out. Users will be happy to hear that, and I’m sure you yourself are excited to finally have people enjoy your game. ITAGAKI:: You are exactly right, really. We’ve been underground developing for 7 years now—it’d only be natural for people to forget. FAMITSU: But inevitably around spring—around the timing of E3 [Editors Note: The E3 is a yearly game industry event. ]—it’s become a yearly tradition now that when E3 gets close everyone starts wondering if any new information will be coming out. Last year, you announced that it would be coming out for the WiiU. This year, it’ll be released as you promised. You said last year it’d be coming out in 2015. ITAGAKI: That’s right. After we announced it at E3 last year, we had a lot of feedback from users such as “Can’t you improve the graphics?” or “Can you buff up the animations?” After last year’s E3, we spent about six months on really intense polishing—especially the graphics and controls—and just making it just cooler visually. FAMITSU: Not even that he’s bald, but he’s got some kind of . . . mantra?—written all over his body. ITAGAKI: I’ll talk about that a little more later; but for now, we’ve got a particular pride in creating ninjas. Ninja and mantra have this inseparable bond, so by taking this soul of a ninja we combined eastern and western influences, and this is the character we arrived at. FAMITSU: I see. The world that the story takes place in seems to be pretty chaotic as well. An EMP [Editor’s Note: Electromagnetic Pulse] makes all military devices in the world inoperable. Even cars seem to be affected by the pulse . . .
ITAGAKI: Cars wouldn’t work either, yes. FAMITSU: Naturally, things that are pretty much taken for granted these days wouldn’t be possible in this world—like shooting down an enemy with a missile. ITAGAKI: But the terrorists who planned the whole thing were taking cover inside a shelter, so they still have equipment that operates. FAMITSU: The bad guys weren’t affected by the EMP? ITAGAKI: Right. The US military and state-level militaries would have had basic equipment locked away in nuclear or EMP shelters too. We’re only imagining about the US right now; but if an event like this happens simultaneously over the entire world, there wouldn’t be enough military power to control the results. So we’d be going back to say . . . ground combat from the 1940s. The situation would require platoons on the ground facing off against each other. That doesn’t happen these days anymore, does it? FAMITSU: No it doesn’t. [laughs] It’s simpler now. FAMITSU: There are some things that would probably be hard to swallow if it wasn’t set in the real world. ITAGAKI: It’s because I’ve been reading books about war forever now—even since I was in elementary school. There’s no reason to start a war that would put soldiers on the ground running around shooting it out with each other—there’s no realism in that. I mean, as it is now, you can just end the world with the push of a button. [laughs] Next-gen snipers using surveillance cameras to take out their enemies have already been developed and implemented. So I don’t feel any sense of realism when I see soldiers shooting it out in the current games. That’s not war, is it? It’s like . . . airsoft, I suppose; or as we call it in Japan: a “survival game”. It feels like a survival game. FAMITSU: Yes, calling them survival games wouldn’t seem out of place. ITAGAKI: Right. Don’t get me wrong, I have absolutely nothing against those types of games. But as someone who has studied war history and strategy and tactics for a long, long time, I thought to myself that a survival game-type game isn’t what I wanted to make. So I had to create a situation where a war that required those types of close-quarter battles would be appropriate. FAMITSU: Where they would be natural. ITAGAKI: As the first “fiction”, we have the Kessler Syndrome being realized in the opening of the game; but just the other day, I read an article on a military news site about some plan to destroy orbiting satellites. It wouldn’t be strange at all if the Kessler Syndrome actually happened here—right now—in the real world. “The Kessler Syndrome was realized” itself is fiction, but to be technically correct it isn’t complete fiction. It’s actually one very real possible future—one that could happen even five minutes from now. Devil’s Third deals with that future where the Kessler Syndrome happens. The story is about how the world turns out after that event. FAMITSU: If the setting demands realism, you could instill meaning in close-quarter combat. ITAGAKI: Yeah, I can do everything. [laughs] The point isn’t really who would win; the point is that as human beings, we would use anything that we could to fight. We can’t say that just because it’s a game, the only things we would use are guns or short-range knife attacks. [laughs] If you had a bayonet, you’d run them through with it. If you didn’t have a bayonet, you’d beat them over the head with the hilt of your gun. If the game ends up not taking humanity’s natural survival instincts in battle seriously enough, then the whole battle ends up really looking to me like a farce. That’s not what mortal combat is, everyone. [laughs] I don’t participate in survival games myself, but it’d be like me bringing a wooden sword to one and asking if I can hit my opponents with it. ITAGAKI: But you’d bring it to a fight to the death, right? FAMITSU: If it’s not a survival game, then anything would be OK—not just a wooden sword, a real katana would work too. ITAGAKI: If we’re saying we can bring any weapon “as long as it doesn’t kill someone” . . .
FAMITSU: Like a bamboo sword? FAMITSU: So it wouldn’t kill you—just really hurt. FAMITSU: Let’s change the topic then. [laughs] I feel like a lot of Wii U users haven’t really played a game like Devil’s Third before. ITAGAKI: As to how Devil’s Third ended up being released on the Wii U: I visited the Nintendo offices, and explained to them that I had a game. FAMITSU: You went to Nintendo yourself. ITAGAKI: That’s right. THQ, who we originally intended to publish the game with, went through what it did [Original Editor’s Note: THQ declared bankruptcy in December 2012.]. After that, we visited the Nintendo offices and explained, “This is the game that we have . . . Well, this is only what we have.” [laughs] We showed them our documentation and visuals, the gameplay—we showed them everything we had at that point, and gave a proposal. Their people in charge—beginning with President Iwata—said, “Let’s do it.” This is just my assumption, but I think the reason why he said, “Let’s do it,” is because a varied lineup of titles is necessary for any hardware. I like to think the staff at Nintendo—beginning with President Iwata himself—felt the possibilities in our game to be a new type of shooter, a new type of action, a new type of game. FAMITSU: After it was decided it’d be a Wii U game, did you have any requests from Nintendo? ITAGAKI: Yep. I’m getting a little ahead of myself, but Mario Club was amazing. [laughs] They are really intense. FAMITSU: You heard back from them a lot? Requests, feedback? ITAGAKI: We got a lot of feedback. Everyone was really positive and enthusiastic. One thing we ran into though is that there really haven’t been any other titles from this type of genre—not specifically the Wii U, but titles like this coming from Nintendo itself. There aren’t any previous examples, so the standards weren’t really defined. While our staff was developing Devil’s Third, we were setting targets trying to push the Nintendo hardware as far as possible—overcoming obstacles one by one . . . or sometimes going around them. [laughs] Then we’d get into discussions with Nintendo like, “This is how far we’ve come, let’s keep going,” to which they would respond, “Well, we know you want to . . . .” Then we’d say back, “Then let’s do it!” and in the end, Nintendo finally told us, “Alright then, do it!” (laugh) We’re mercenaries hired to win the battle. Mercenaries working together to win. FAMITSU: That’s just how rare this game is on Nintendo hardware. FAMITSU: I’m sure there were still some things that you had to keep held back though. I’d like to talk a little more about the game itself. The main character himself is a terrorist? And he’s been captured? ITAGAKI: Right. To put it simply, the Boshin War . . . At the end of the Edo period—around the Meiji Restoration towards the end of the Boshin War—Takeaki Enomoto was forced to flee to Hakodate. And the Oniwaban—you know, the Shogun’s ninja squad—also moved to Hokkaido in order to protect Tokugawa. But at the Battle of Hakodate, they are defeated by the new government army—bringing an end to the Boshin War. After the battle, Enomoto’s forces asked the new government to recognize Hokkaido as Tokugawa territory, but the new government refused. So the Oniwaban ninjas, the Shinsengumi, and the former shogunate army enter one final battle with all the strength they have left. Hijikata Toshizo eventually falls in battle and Enomoto surrenders himself to the government. But the Oniwaban could not accept the new Meiji government, who treated them as rebels, so they fled to Iturup. As you know, a ninja will never rest until he has completed his mission. If the father isn’t able to complete it, his son will, or his son’s son, and so on. The ninja that fled to Iturup live on with one purpose alone: to restore Japan to the Shogunate. As time goes by however, the island ends up under control of the former Soviet Union. These ninja then devise a plan to overthrow the Japanese government, which they view as an extension of the Meiji government, by manipulating the Soviet Union. They successfully maneuver themselves and are appointed to one of the Soviet Union’s Special Forces groups. There, they combine their ninja techniques with modern martial arts training. Then in 1991, the Soviet Union collapses. The World Revolution social experiment that the Soviets had been aiming at folds before it is realized, and communism is banished from the country. So these ninjas, descendants of Tokugawa’s Oniwaban, were big believers in the World Revolution. So when the Soviet Union falls, it’s the second time they are betrayed by their country, and once again they are treated as rebels. They flee back to the Far East, choosing to not align themselves with any country. That’s where the story begins. Now as for how this becomes a battleground, there’s a very rare and valuable metal called Rhenium, and this area is rich with it. This is actually a fact. So with Japanese money and the US and Russia also looking to get in on the action, the three countries enter a Japan-US-Russia Security Treaty, and the island begins to see development in many ways. That’s the setting in which the story of Devil’s Third takes place. FAMITSU: I see . . . It seems you needed a really deep setting to introduce a lot of factual details. ITAGAKI: We aren’t really including too much fiction. If the base isn’t solid, there’s no way you can make an interesting game. FAMITSU: Many people probably won’t realize it while they play, but as they look into the background they’ll realize that it isn’t fiction. ITAGAKI: Right. I think that is really interesting—Ninja Gaiden had something like ninja diaries, right? [laughs]—those kinds of things. FAMITSU: By the way, did you put anything in place for people who aren’t very good at action or shooting games? ITAGAKI: To be precise, people who aren’t that great at shooters can duke it out with the action elements; people who don’t do action games well can battle with the shooting elements. FAMITSU: I see. Also, as I was playing I noticed quite a lot of save points—and they were auto-saves. ITAGAKI: I can’t say there won’t be any places where you’d say, “Where’s the save point! ?” but there probably won’t be. Anyway, we’ve set it up in the modern style, so you can always be progressing forward. And we’ve evolved it a bit. ITAGAKI: Some games have auto-save, but don’t tell you when you’ve hit a save, right? FAMITSU: Ahhh. [laughs] I understand. ITAGAKI: With that system, you can’t ever sleep. [laughs] You never know when you’ve hit a save. So when you reach an auto-save, an icon will appear making it easy to know when you’re saved [laughs]—kind of a “Don’t worry, you’re saved.”—and it looks good. It’s not annoying at all. FAMITSU: It’s a point you seem pretty concerned with. FAMITSU: Very user-friendly design. [laughs] Also, I heard a lot about the multiplayer. Players especially seemed to be very interested in the multiplayer videos that have been released. Throwing fruit around . . . it doesn’t look like your normal multiplayer. [laughs] The setting seems well done, and you can also engage in diplomacy or join alliances with other clans? ITAGAKI: Doesn’t that sound real to you? If a conflict started . . .
FAMITSU: Indeed. First, I’d be avoiding fights and looking for allies. ITAGAKI: Right. That’s why we implemented a diplomacy chat. Of course, if all the members were participating, it’d be impossible to follow; so that’s why it’s limited to just generals [the highest-ranked clan member], and captains [officers]. As the clan grows in size, the number of captains it can appoint increases, and captains can begin and engage in diplomacy chat themselves. There are a lot of things they can do—not just diplomacy, but managing and discussing internal affairs, et cetera. Generals and captains from multiple clans can also join in large meetings. Just like a top-level summit. So, chat is a really important part of the game. It can be used to discuss strategy: “We’re going to launch an offensive against this clan this day of this month, so we’ll need you to do so and so.” Sounds fun, doesn’t it? FAMITSU: Sounds completely like the military. FAMITSU: That sounds like something really interesting you don’t find in other games. Of course, using your own ability to take down an opponent is a part of every game, but not just that: negotiating and entering alliances . . . and of course, just because you signed an alliance doesn’t mean you are totally safe. FAMITSU: You’re exactly right. [laughs] You think something will be alright, and it turns it not to be. People are really looking forward to it because it has that psychological element as well. Can you play the game focused only on multiplayer? FAMITSU: That’s definitely something I felt playing through Chapter 1 today. I’m kind of worried that once I get started in multiplayer—get a clan set up—it might be difficult for me to go back to solo-player. FAMITSU: Even still, it took a very long time. 6 . . . 7 years since conception? A lot happened in that time. As you mentioned earlier, the THQ bankruptcy . . . Why were you able to continue all this time without giving up on Devil’s Third? It started out as a Valhalla game, right? 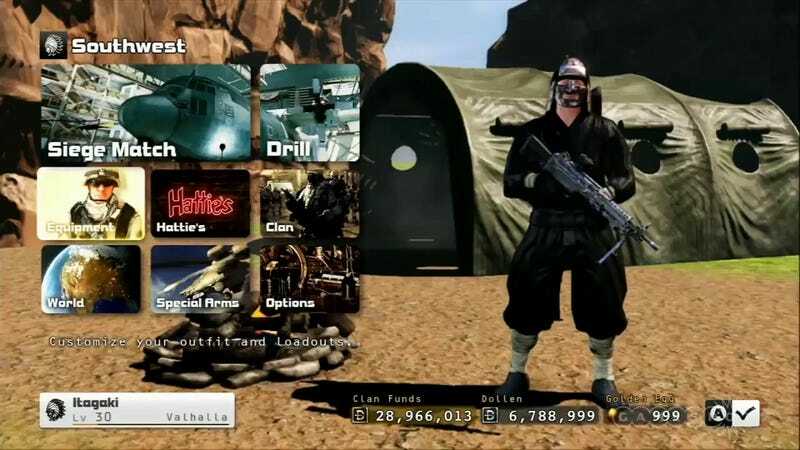 It seems there really was a lot with Devil’s Third: the THQ bankruptcy, and even before that. It took a long time, but now it’s finally going to be released. With all the time that passed, I’m really amazed that you didn’t give up the project. I don’t think anyone would be surprised if you had given up. ITAGAKI: Well . . . If we had given up, then we wouldn’t be able to show our face to all the people that had supported us up to that point. There wouldn’t be any opportunity for us to work in this industry anymore. That’s just how it is. We developed Ninja Gaiden in 4 years, and that was with us developing multiple lines at the same time, so it’s not a particularly long time. Our desire was to complete the game by any means while establishing our company structure, developing the game itself, and keeping the company going all at the same time. We were finally able to make it through thanks to Nintendo who really made it all possible along with everyone in the industry, and also thanks to the expectations from all the fans and gamers that were waiting. With all that support, I couldn’t be someone who would drop it all and walk away. That’s one part. And on top of all that, we had already made the decision to make the game. We brought in staff to execute that decision. Those staff, their families . . . I’m repeating myself, but all of our fans . . . I couldn’t just betray them. “So you did it just as some personal responsibility?” No, it’s not like that either. You know, sometimes if I’m speaking with someone, they’ll tell me that I’ve changed. Establishing my own company, I’m pretty much free to do what I want, and I’m also solely responsible for what I do. It can be a pain sometimes, but at the same time it gets you in the mood to just get it done. So as I said before, for all the support we’ve received in every form imaginable, and for letting me introduce Devil’s Third like this here today, I’m incredible grateful. Like I said in the beginning, it’s a culmination of everything so far—not just mine, but of everyone that works here. Please try it for yourself. I think it’s going to be a breakthrough for the industry. I believe it’s going to take shooters to the next level. FAMITSU: Thank you for letting me try it out. I think you were able to make something special here. ITAGAKI: It’s really packed with content. Both the story mode and multiplayer mode could each stand alone as their own titles. We’ve ended up making gamers wait to accomplish that; but now that it’s done and ready to play, I hope that we can enjoy it together once it’s released. FAMITSU: You’re saying we can play with you and the Valhalla staff together online? ITAGAKI: Of course. Let’s play it together after release! That’s exactly what we’ve been working towards for so long. Once it’s released, we’ll definitely be making a Valhalla clan right away. ITAGAKI: By all means. [laughs] I’m in charge of having fun. [laughs] We’ll be looking forward to playing with you all. Always time well spend reading into the insights of such a unique video game producer’s mind. If you want to practice your Japanese, the original interview is here. Now let us hope the online multiplayer experience lives up to his vision.